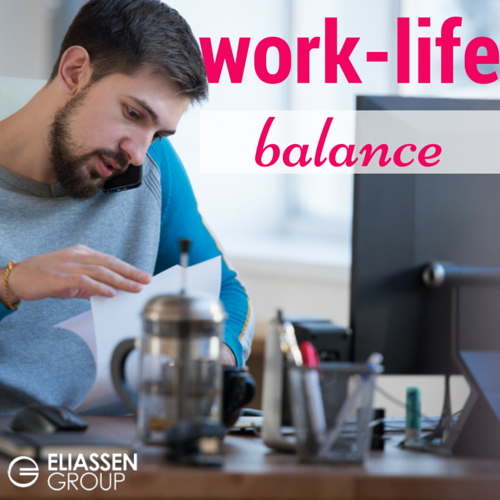 Work-life balance is a very popular topic of discussion and some would argue that there is no such thing. These days, working families face growing financial pressures while corporations seek to maximize the productivity of their workforce. Add to this situation the always-on phenomenon brought to us by laptops, tablets and smart phones and many professionals end up feeling stressed out, burned out and lacking a healthy, balanced lifestyle. But the facts are even scarier than that. A recent US News report talks about a Harvard Business School and Stanford University study that found “stress at work is just as damaging to a person’s health as secondhand smoke.” Those who live with chronic stress are at a much higher risk of anxiety, depression, and high blood pressure. They also tend to have higher rates of obesity and heart disease. These conditions are not only dangerous for the employee but also have an impact on family relationships and the ability to care for children and family members. What’s interesting, but hardly surprising, is that employers who understand how important it is for employees to be able to attend to their personal lives and support them in this effort end up with employees who are happier, healthier and more productive. To this end, some companies are offering better benefits such as family leave or more vacation time in an effort to recruit great talent. The irony of these programs, however, is that many workplace cultures still frown on employees taking this family leave and vacation time so many employees leave these benefits on the table for fear of the stigma that may be associated with taking personal leave. How can you strike a balance between work and personal goals? 1. Take a lead from the younger generations. One of the key trends we’re seeing in the marketplace is a move towards a broader set of benefits. Whereas years ago employees were heavily focused on their earning potential and insurance benefits, younger workers are also looking for training opportunities, flexible work schedules and a heavier focus on giving back to the community. They are favoring job opportunities that will help them achieve their life goals, not just their career goals. 2. DO take advantage of the benefits offered by your employer. While it may not always be feasible to take considerable vacation time depending upon your job function, you should take advantage of the options that will best assist you in achieving your personal and family goals. For example, if there are specific times of the year that are difficult in your position, try to take more time off during the slower periods. Take advantage of paternity leave if your company offers it. Join a company-subsidized gym and take time to exercise, even if you have to drive in a little earlier. All of these things will help contribute to your own personal well-being. 3. Select a flexible career. Another highly critical aspect of work-life balance is to consider and prepare for roles that will provide the most flexibility. In our next post, we provide a list of the best jobs to help you achieve this balance. Stay tuned! Are you seeking a new job that may offer a better work-life balance? Take a look at our current job postings and give us a call: 800.354.2773 or email us: solutions@eliassen.com.